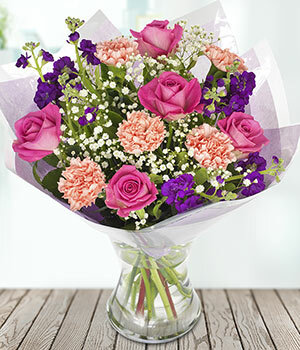 This deeply divine mix of magenta, soft pink and purple blooms will cause love at first sight! Exquisite roses, sweet carnations, and fragrant stocks mingle amidst a cloud of gypsophila to create a ravishing hand-tied bouquet. Your order will be carefully packed in a specially designed flower box.